15x 4K optimized 25.5-382mm f/2.0-4.5 optical lens, multiple aspheric elements. Is that an actual photo of the camera? I would have expected the XF400 and XF405 to have a larger, more professionally-oriented body similar to the other cameras in the XF line (XF200/205 and XF300/305). Doesn't even look like there is space for a top-handle or XLR audio inputs. This photo looks more like one the consumer line of Canon camcorders, like perhaps an HF G30 successor. 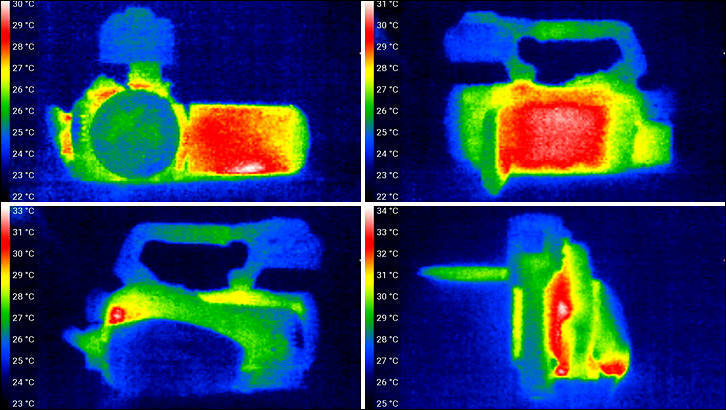 So, yes it is from consumer like camcorder. 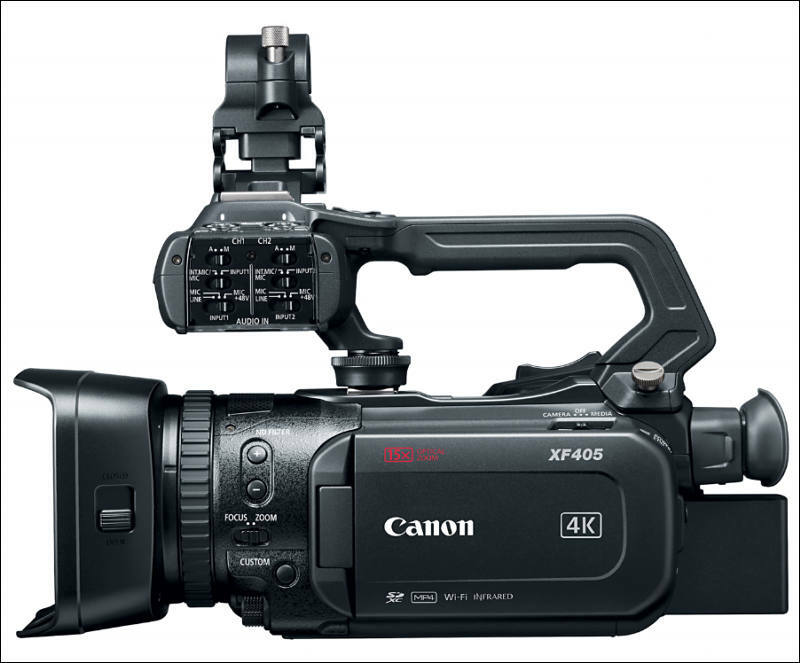 MELVILLE, N.Y., September 12, 2017 – Canon U.S.A. Inc., a leader in digital imaging solutions, today announced three new additions to the company’s video camcorder lineup: the XF405 4K UHD Video Camcorder, the XF400 4K UHD Video Camcorder and the VIXIA GX10 4K UHD Video Camcorder, three lightweight and compact video camcorders that feature 4K/60p video recording. 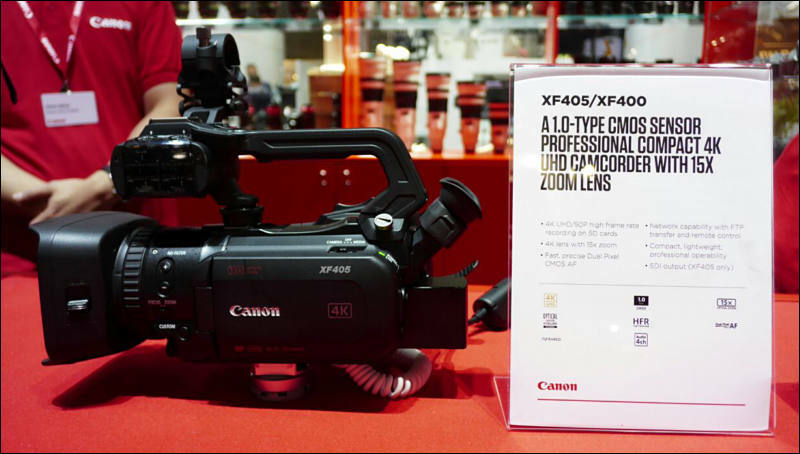 The Canon XF405 and XF400 4K UHD Video Camcorders are both ideal for applications like broadcast interviews, documentaries and weddings. Designed with advanced amateurs and hobbyists in mind, the VIXIA GX10 4K UHD Video Camcorder provides the same high- image quality as the Canon XF405 and XF400. All three models feature a newly developed 15x optical zoom lens (35 mm film equivalent: 25.5mm–382.5mm), to support 4K recording, alongside a 1.0-inch CMOS sensor and Dual DIGIC DV 6 image-processing platform, to produce stunning 4K/60p recording across the entire zoom range. In addition, the compact and lightweight body designs measure approximately 5.3in (l) x 3.8in(h) x 8.4in(d) and weigh approximately 40.5oz, 40.3oz and 40.2oz for the XF405, XF400 and VIXIA GX10, respectively. The compact and lightweight nature of all three 4K UHD models provide great mobility when shooting such scenes as news reports and events. If only these were releasing much sooner than November. If this camera can deliver enough shallow dof and good low light performance, then there is no reason to carry a mirrorless camera with lots of lenses. a camcorder can be much more practical. It is not entirely clear if XLR attchement can be used with Legria also. Usually on the the XA series (or in this case the XF series) has the rear attachment screw holes and multi-pin connector socket to attach the top handle with XLR ports. This is how the audio (and other controls from the handle) get into the camera. The front shoe mount is just for stability and does not transmit data. The consumer models (Legria and Vixia) have some kind of Canon proprietary hot shoe mount in the back where the XLR handle would attach, but it's slightly different from the connector on the XA/XF models, so the XLR handle doesn't fit mechanically. There are also no screw holes in the consumer models for the handle. Yes, but here body seems exactly same. This looks like the x70 or x100 from Sony, which is now several years old, it will be interesting to compare the IQ. The aged x100 has a very sharp Zeiss lens, but not the best face tracking. You mean it is similar form factor, Sony model is AX100. And it is very different from it with 4K 60fps, dual pixel sensor making it far superior for video focusing, dual SD slots. Yup, the Sony does not do 60fps, but it has a very good codec. I still think it is $1000 overpriced. Interesting to see if people will buy it, or whether Sony will finally upgrade the ax100. They both have the one inch sensor, so should be easy to compare the IQ. The Sony has a seriously good lens through 80 percent of its range. The Sony focuses very well, but it does not track as well as the Canon camcorders. I'm guessing the tracking/focusing will be better. If you focus manually, as I do most of the time, then it isn't a big deal, but tracking can be very useful. Canon color, we shall see. Canon is great at screwing stuff up, but they have had a long time to work on this camera. My ax100 has a much better lens than my 1080p canon camcorders. 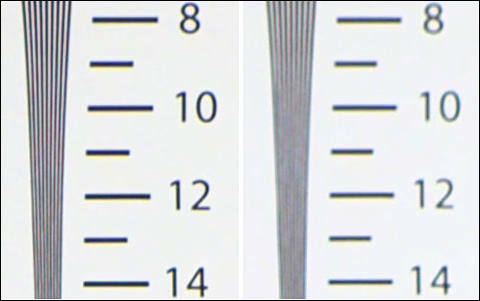 @apefos the one inch sensor will only give you a shallow DOF look in telephoto. It's a good look, but not exactly like a larger sensor with a wide open prime. Yes, it will be less shallow dof comparing to m43 with prime lenses, but it can be good enough for indie films, considering the "one piece solution". For all kind of Television productions it can be just perfect. Wow, that's fuzzy, interesting to see if firmware will fix it. You mean dynamic stabilizer mode? No way, just look at the sensor resolution at first post here.